I’ve written before about some of the advantages (and pitfalls) of using GPS units to set accurate time in cameras. Having accurate time enables geocoding of photos, and makes it a lot easier to manage images from multiple cameras. One of the issues with setting the time via GPS is that for the camera to convert the GPS time (call it UTC/GMT) to the local time it needs to know what timezone you’re in. I wrote another note about this (in 2014). Unfortunately most cameras have a list of timezones to choose from (and a Daylight Saving flag you can enable/disable for a 1-hour difference) but they don’t have all timezones. I wrote last year about the examples of Australia’s Lord Howe and Norfolk Islands, with suggested workarounds to fool the camera. Another example was New Zealand’s Chatham Island (45 minutes ahead of NZ) which many cameras don’t know about or have workarounds for. Now it seems that at least one camera manufacturer has recognised the problem and come up with a solution! 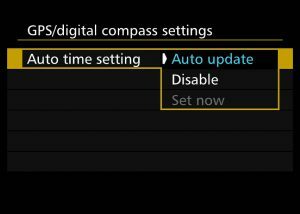 As well as a list of timezones, Canon’s new EOS 80D camera has a “Time difference” setting where you can specify the UTC offset down to at least the nearest 15 minutes (which should hopefully accommodate all timezones). Three EOS models (the 6D, 7D Mark II, and 1D X Mark II) have internal GPS receivers and can tag photos with locations, record trails of your movement (which can later be used to geotag photos from other cameras), and to set the camera’s time to within +/- 1 second (the 1D X has even higher precision). Some other EOS models support Canon’s external GP-E2 GPS receiver which can provide the same functions. Those models are the EOS 1D X, 5D Mark III, 5Ds, 5Ds R, 70D, 80D, 650D (Rebel T4i), 700D (T5i), 750D (T6i), 760D (T6s), and 1200D (T5), as well as the EOS M, M2, and M3 mirrorless cameras. The 7D can tag photos using the GP-E2, but in my testing doesn’t seem to be able to set the time. Older EOS cameras do not support GPS receivers (and thus don’t have any concept of timezone). The GP-E2 can be connected to the above cameras via a cable to the USB port, or on all those cameras except the 7D and the 1200D it can be connected via the flash hotshoe. The 1D X also supports the GP-E1 GPS receiver with the same functions (except without the ability to record trails). My Olympus TG-4 waterproof compact camera has its own internal GPS, as does my Sony ActionCam. All the other cameras I use are on the above list of EOS models, and the GP-E2 provides a convenient way of occasionally checking the cameras’ times are correct. The camera clocks do slowly drift by themselves, and I find it useful to update them at least every few weeks. Unfortunately I have recently found some cases where the Canon EOS Utility program (which I’ve generally used in the past to set the camera time via USB) can sometimes introduce a gap of 4-10 seconds from the computer’s time. The GP-E2 is a lot more precise, can be used out in the field, and also allows me to record a GPS trail without using up the battery of one of the other cameras (it runs all day off a single rechargeable AA). Incidentally, one note about the GPS time-synchronisation in the Olympus TG-4 (and probably in other compact cameras). The camera has the concept of a Home timezone and a Travel timezone, allowing you to quickly switch from home to your destination and back without having to actually change the time. However, GPS time synchronisation is only supported in the Home timezone (in the Travel zone it silently fails). Thus when I travel with this camera I have to ignore the Travel zone, and instead update the definition of the Home zone. Why do they do this? Unfortunately the obvious answer is lazy software design.